We're not sure if Dave Grohl actually keeps getting hotter or if he's made a deal with the devil. It was, quite simply, the best, the best, the best, the best of Foo. Opening their 160-minute concert with “Bridge Burning,” Dave Grohl and company electrified the 13,000 in attendance at the Scotiabank Saddledome with a pure and straightforward display of rock and roll. “These are my famous last words,” Grohl roared to the approval of the Foo faithful. After an offering of “Rope” — the second track off the 2011 album Wasting Light — and second song of the night, the band launched into more familiar material, including “The Pretender,” “My Hero” and “Learn to Fly,” with Grohl encouraging the crowd to sing along all the while. 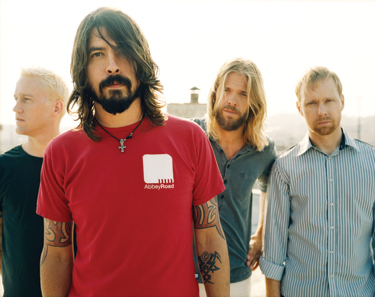 While the Foo’s bassist Nate Mendel, guitarists Chris Shiflett and Pat Smear and drummer Taylor Hawkins are an impressive group, there is no doubt Grohl is the leader. He patrols the stage and commands the attention of the crowd like a rock-and-roll drill sergeant, and plays with the passion and energy of someone younger than his 42 years. In a lot of ways it’s hard to believe it’s been 16 years since the release of the Foos’ self-titled debut album, which peaked at No. 23 in the United States and No. 5 in Canada. One of the evening’s funnier moments occurred when Grohl informed the crowd that the Foos weren’t one of the “new bands” that only play an hour and 45 minutes. “We play for an hour and 55 minutes,” he laughed, before polling the audience on how long they should play. During the show Grohl, sprinted from the main stage down a catwalk that bisected the floor and onto a small stage at the other end of the arena on a number of occasions. Once there, the stage would slowly raise and the former Nirvana drummer would once again lead the crowd in song, particularly during the first three songs of the encore, which Grohl performed basically as an acoustic solo. Those songs — “Wheels,” “Best of You” and “Times Like These” — turned the Saddledome into a sort of rock and roll karaoke bar with Grohl styling the lyrics. From there, the band did a solid cover of Tom Petty’s “Breakdown” before ending the night, appropriately enough with “Everlong,” from the 1997 album The Colour and the Shape. The Foo Fighters battled the Saddledome on Thursday, Oct. 27 and opening the show were Mariachi El Bronx and Canada’s Cage the Elephant.